Tesco sells Blinkbox Music to Australian streaming service Guvera | What Hi-Fi? Guvera might not be a name you're familiar with at the moment – but it could become the newest addition to the UK music-streaming market, after it acquired Blinkbox Music. The service has been sold to the Australian company by supermarket giant Tesco and will provide Guvera with a handy foothold in the UK market as it takes on 2.5 million app-registered users. It's expected the deal will "help significantly accelerate the growth of Guvera’s business" and, with Blinkbox Music's existing expertise, enable the service "to expand into Western Europe faster". Guvera was founded in 2008 but its European presence is limited to Ukraine and Russia for now. It already operates in 20 countries, including India, USA, Singapore, Thailand and Argentina. It has licensing deals with labels such as Universal Music Group, Warner and Sony and it's similar to Blinkbox Music in that it has two options: a free, ad-supported service and a paid-for service. Guvera is the worldwide music partner to Chinese mobile manufacturer Lenovo – a deal that sees its service pre-installed onto handsets sold in 160 worldwide markets. 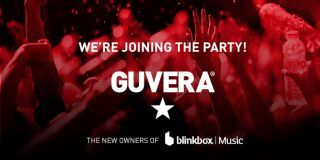 Guvera global chief operating officer, Michael de Vere, said : “The acquisition of Blinkbox Music is an important new chapter in the Guvera story, adding significant firepower to our product." Phil Quartararo, chief content officer and president of Guvera USA, added: "London is firmly the place to be. It certainly feels like it’s becoming the Silicon Valley for music streaming." The deal comes less than a month after Blinkbox Music's movie-streaming sibling (Blinkbox Movies) was sold by Tesco to TalkTalk.